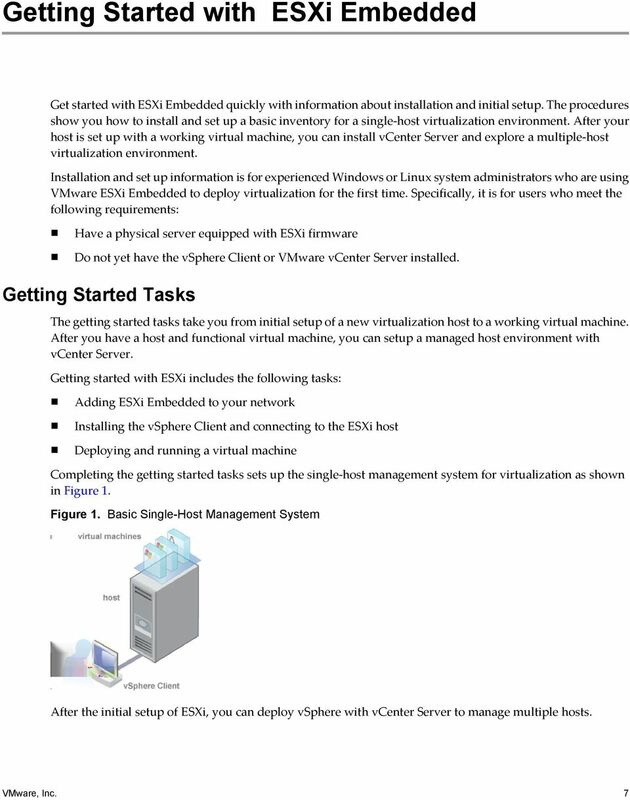 Download "Getting Started with ESXi Embedded"
2 You can find the most up-to-date technical documentation on the VMware Web site at: The VMware Web site also provides the latest product updates. 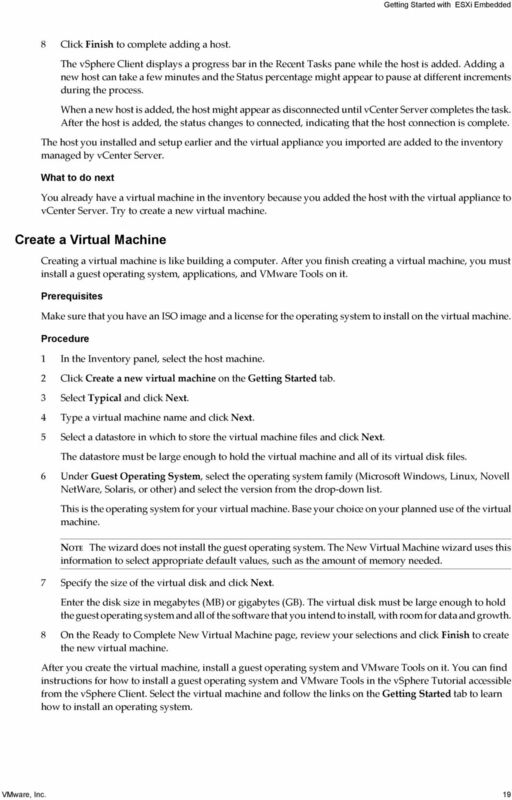 If you have comments about this documentation, submit your feedback to: Copyright 2012 VMware, Inc. All rights reserved. This product is protected by U.S. and international copyright and intellectual property laws. VMware products are covered by one or more patents listed at VMware is a registered trademark or trademark of VMware, Inc. in the United States and/or other jurisdictions. All other marks and names mentioned herein may be trademarks of their respective companies. 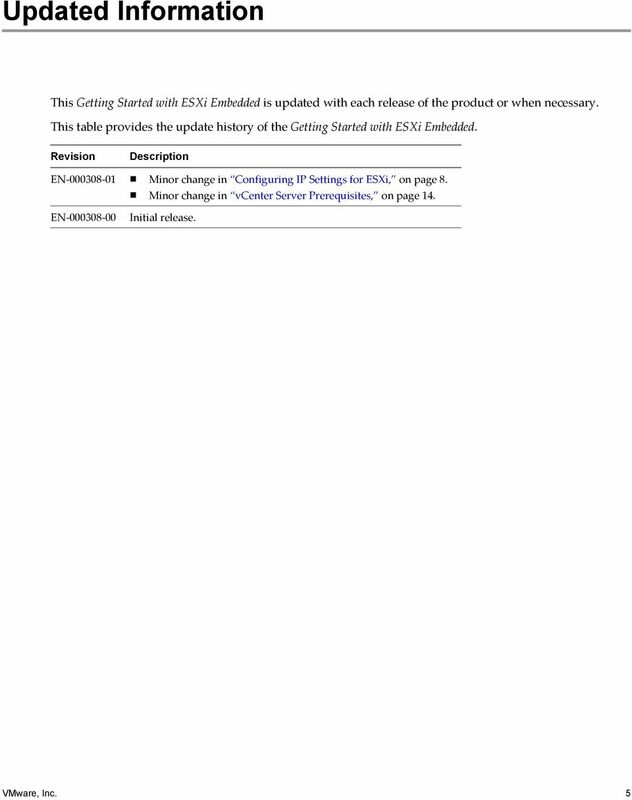 VMware, Inc Hillview Ave. Palo Alto, CA VMware, Inc.
8 Setting Up ESXi Setting up ESXi involves configuring the Administrative (root) password for the ESXi host and configuring the default networking behavior. Before you begin these tasks, you must have the following set up: An ESXi system that is connected to a monitor and a keyboard and that is powered on. (Optional) At least one other computer to act as a management station. This computer must be running Windows and have network access to the ESXi host. Consider using a network with a DHCP server. NOTE If a system failure occurs, you can restore the ESXi software. When you power on the ESXi host for the first time, it enters an autoconfiguration phase during which system network and storage devices are configured with defaults. After the host completes the autoconfiguration phase, the direct console appears on the attached monitor. Using a keyboard attached to the host, press F2 to examine the default configuration. As the system administrator, you can make changes to the default configuration, such as creating the administrator password or setting the static IP address. VMware recommends that you configure your administrative access settings and server network. Set the Password for the Administrator Account You can use the direct console to set the password for the administrator account (root). The administrative user name for the ESXi host is root. By default, the administrative password is not set. 1 From the direct console, select Configure Password. 2 (Optional) If a password is already set up, type the password in the Old Password line and press Enter. 3 In the New Password line, type a new password and press Enter. 4 Retype the new password and press Enter. 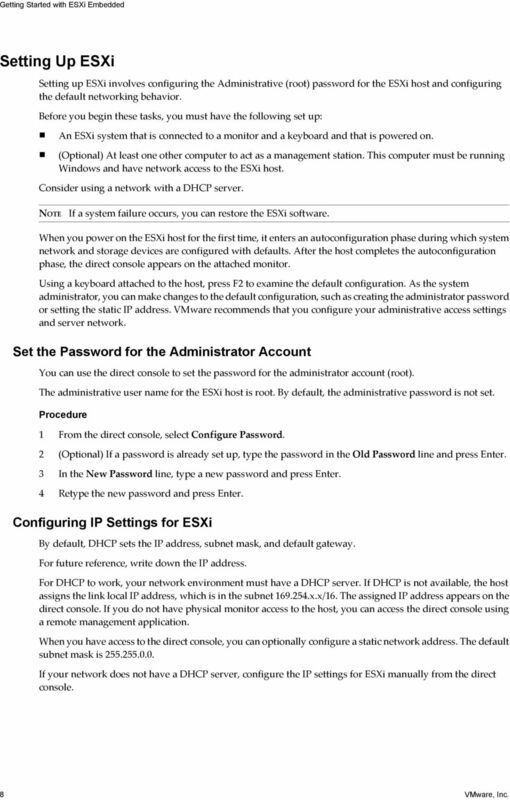 Configuring IP Settings for ESXi By default, DHCP sets the IP address, subnet mask, and default gateway. For future reference, write down the IP address. For DHCP to work, your network environment must have a DHCP server. If DHCP is not available, the host assigns the link local IP address, which is in the subnet x.x/16. The assigned IP address appears on the direct console. If you do not have physical monitor access to the host, you can access the direct console using a remote management application. When you have access to the direct console, you can optionally configure a static network address. The default subnet mask is If your network does not have a DHCP server, configure the IP settings for ESXi manually from the direct console. 8 VMware, Inc.
10 Networking Gigabit connection recommended vsphere Client Software Requirements Make sure that your operating system supports the vsphere Client. For a list of supported operating systems, see the vsphere Compatibility Matrixes at on the VMware vsphere documentation Web site. The vsphere Client requires the Microsoft.NET 3.0 SP1 Framework. If your system does not have it installed, the vsphere Client installer installs it. The.NET 3.0 SP1 software might require Internet connectivity to download additional files. Download the vsphere Client The vsphere Client is a Windows program that you can use to configure the host and to operate its virtual machines. You can download vsphere Client from any host. Prerequisites You must have the URL of the host, which is the IP address or host name. The system must have an Internet connection. 1 From a Windows machine, open a Web browser. 2 Enter the URL or IP address for the host. For example, or 3 Click Download the vsphere Client under Getting Started. 4 Click Save to download the vsphere Client installer. The vsphere Client installer is downloaded to the system. What to do next Install the vsphere Client. 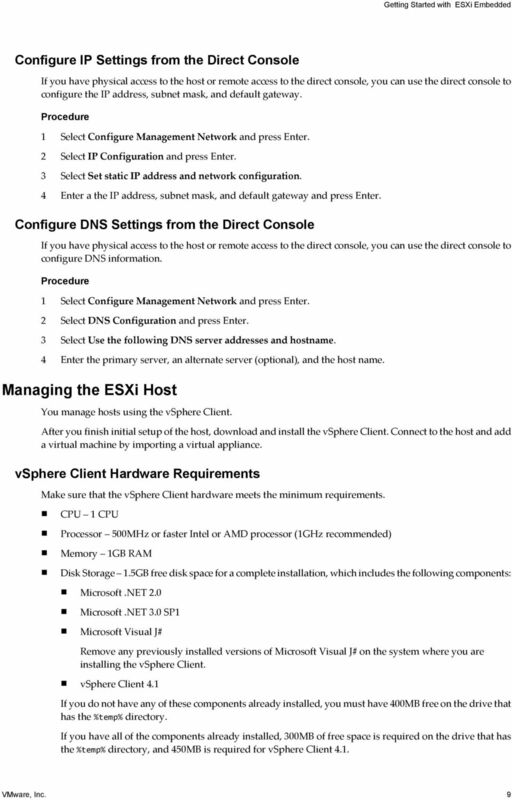 Install the vsphere Client The vsphere Client enables you to connect to an ESXi host and to a vcenter Server system. The vsphere Client must be installed on a Windows machine that has network access to the ESXi host and Internet access. When you use the vsphere Client, the vsphere Client appears in the language associated with the locale setting on the machine. You can alter this behavior with a command-line instruction or by changing the locale in the registry of the machine. 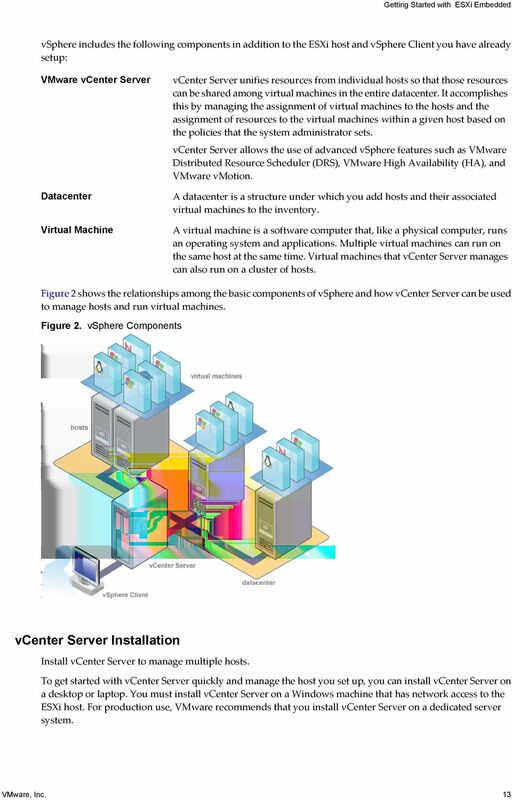 See the VMware vsphere Datacenter Administration Guide. 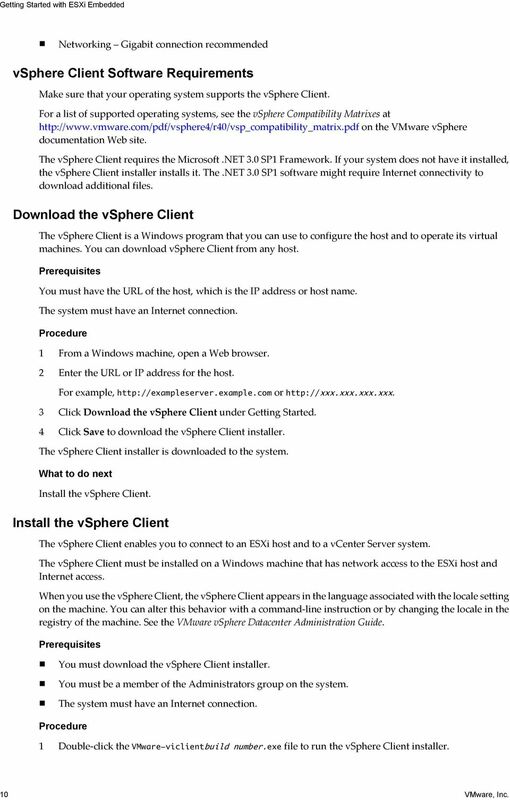 Prerequisites You must download the vsphere Client installer. You must be a member of the Administrators group on the system. The system must have an Internet connection. 1 Double-click the VMware-viclientbuild number.exe file to run the vsphere Client installer. 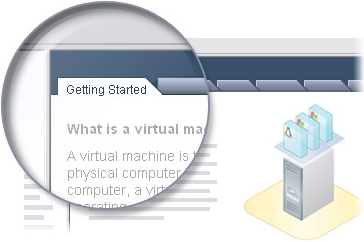 10 VMware, Inc.
12 1 In the Getting Started tab, click Deploy from VA Marketplace. 2 Select a virtual appliance from the list and click Download now. For the shortest download time, VMware recommends that you chose a small virtual appliance. 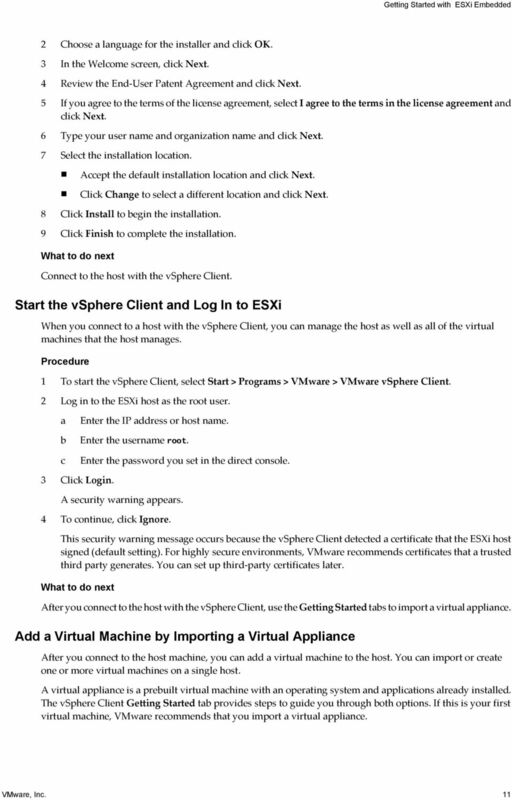 3 Click Next and follow the on-screen instructions to import the virtual appliance. You have completed setup for a single-host management system in which ESXi is used to run virtual machines. What to do next After you import the virtual appliance, you can use the Console tab in the vsphere Client to power it on and see what is running on it. Using the Console to view the virtual appliance is like having a monitor connected to the virtual appliance. To release the pointer from the Console, press Ctrl+Alt. To view the Console in full screen mode, from the Inventory, right-click the virtual machine and select Open Console. Managing Multiple Hosts with vcenter Server You can manage multiple hosts at the same time with vcenter Server. Using vcenter Server to manage multiple hosts allows you to experiment with advanced management options, such as resource sharing, and all of the other options available within a virtual infrastructure. Deploying vcenter Server provides many advantages over deploying a single, standalone ESXi host. 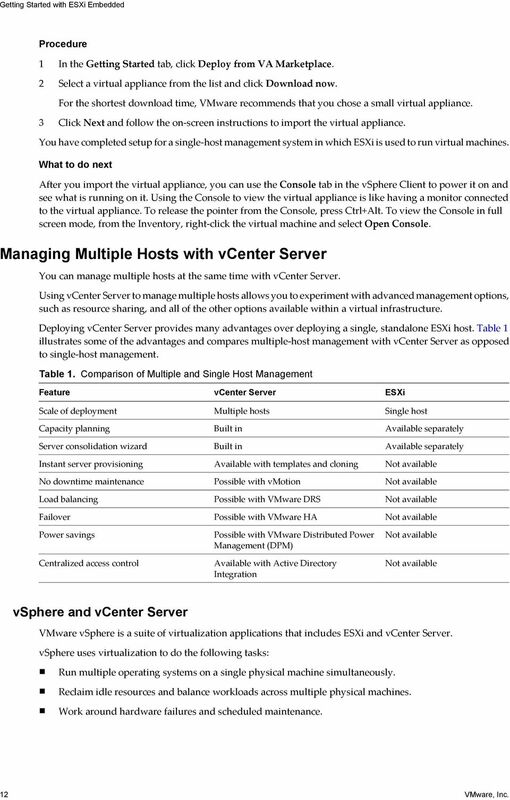 Table 1 illustrates some of the advantages and compares multiple-host management with vcenter Server as opposed to single-host management. Table 1. Comparison of Multiple and Single Host Management Feature vcenter Server ESXi Scale of deployment Multiple hosts Single host Capacity planning Built in Available separately Server consolidation wizard Built in Available separately Instant server provisioning Available with templates and cloning Not available No downtime maintenance Possible with vmotion Not available Load balancing Possible with VMware DRS Not available Failover Possible with VMware HA Not available Power savings Centralized access control Possible with VMware Distributed Power Management (DPM) Available with Active Directory Integration Not available Not available vsphere and vcenter Server VMware vsphere is a suite of virtualization applications that includes ESXi and vcenter Server. 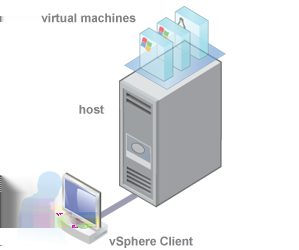 vsphere uses virtualization to do the following tasks: Run multiple operating systems on a single physical machine simultaneously. Reclaim idle resources and balance workloads across multiple physical machines. Work around hardware failures and scheduled maintenance. 12 VMware, Inc.
14 Before you install vcenter Server, make sure your system meets the minimum hardware and software requirements. vcenter Server requires a database. vcenter Server uses Microsoft SQL Server 2005 Express for small deployments with up to 5 hosts and 50 virtual machines. For larger deployments, VMware supports several Oracle and Microsoft SQL Server databases. Refer to the vsphere Compatibility Matrixes for the list of supported databases. vcenter Server and the vsphere Client Hardware Requirements The vcenter Server system is a physical machine or virtual machine with access to a supported database. The vcenter Server system must meet specific requirements. Also make sure that the vsphere Client machines meet the hardware requirements. Minimum Requirements for vcenter Server CPU Two 64-bit CPUs or one 64-bit dual-core processor. Processor 2.0GHz or faster Intel or AMD processor. Processor requirements might be higher if the database runs on the same machine. Memory 3GB RAM. Memory requirements might be higher if the database runs on the same machine. 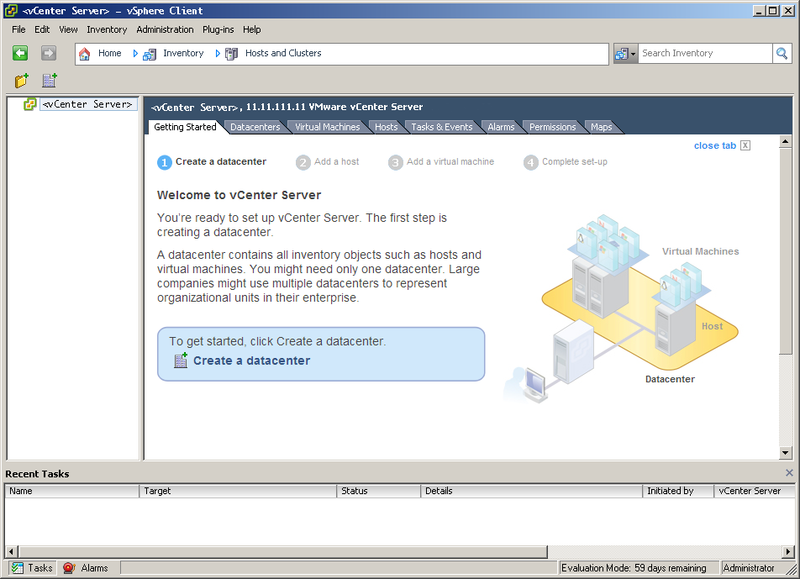 vcenter Server includes a service called VMware VirtualCenter Management Webservices. This service requires 512MB to 4.4GB of additional memory. 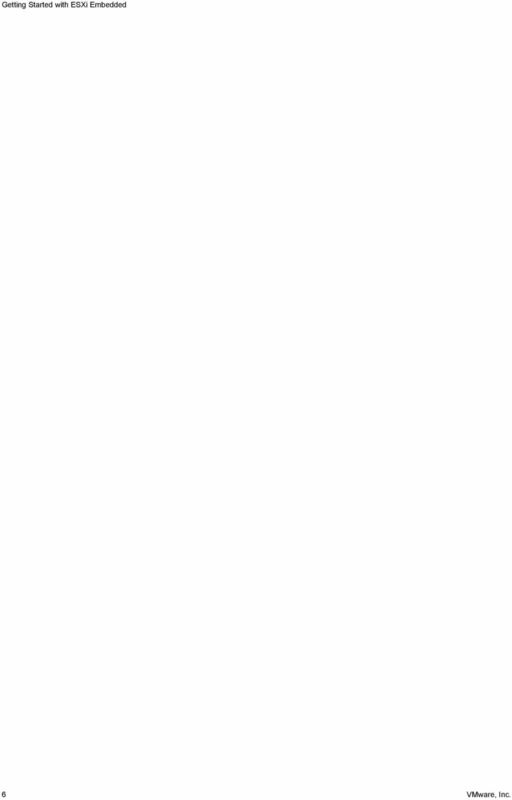 The maximum Webservices JVM memory can be specified during the installation depending on the inventory size. Disk storage 3GB. Disk requirements might be higher if the database runs on the same machine. Microsoft SQL Server 2005 Express disk requirements Up to 2GB free disk space to decompress the installation archive. Approximately 1.5GB of these files are deleted after the installation is complete. Networking Gigabit connection recommended. NOTE Installing vcenter Server on a network drive or USB flash drive is not supported. See your database documentation for the hardware requirements of your database. The database requirements are in addition to the vcenter Server requirements if the database and vcenter Server run on the same machine. vcenter Server Software Requirements Make sure that your operating system supports vcenter Server. vcenter Server requires a 64-bit operating system, and the 64-bit system DSN is required for vcenter Server to connect to its database. For a list of supported operating systems, see the vsphere Compatibility Matrixes at on the VMware vsphere documentation Web site. 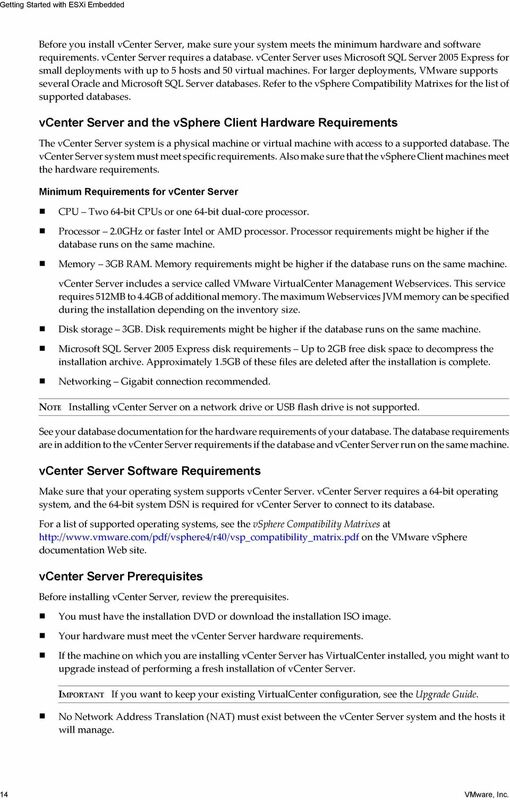 vcenter Server Prerequisites Before installing vcenter Server, review the prerequisites. You must have the installation DVD or download the installation ISO image. Your hardware must meet the vcenter Server hardware requirements. If the machine on which you are installing vcenter Server has VirtualCenter installed, you might want to upgrade instead of performing a fresh installation of vcenter Server. IMPORTANT If you want to keep your existing VirtualCenter configuration, see the Upgrade Guide. No Network Address Translation (NAT) must exist between the vcenter Server system and the hosts it will manage. 14 VMware, Inc.
16 3 Choose a language for the installer and click OK. This selection controls the language for only the installer. 4 When the Welcome screen appears, click Next. 5 Review the End-User Patent Agreement and click Next. 6 Read the license agreement. 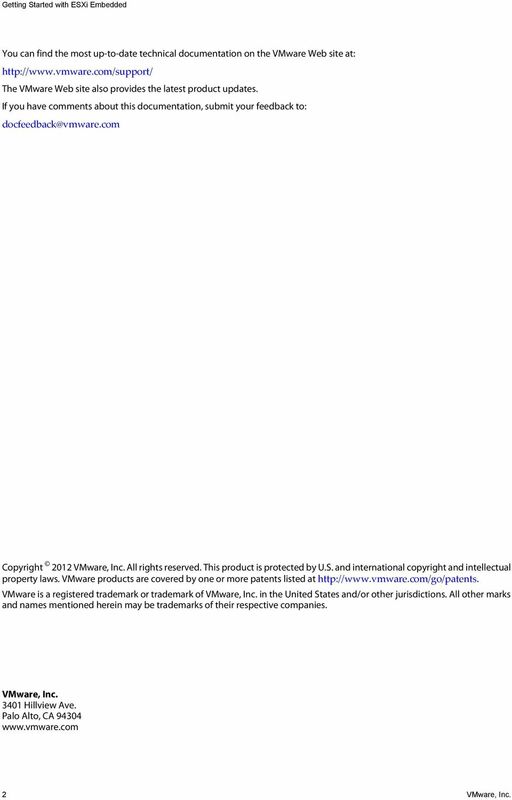 If you agree to the terms, select I agree to the terms in the license agreement and click Next. 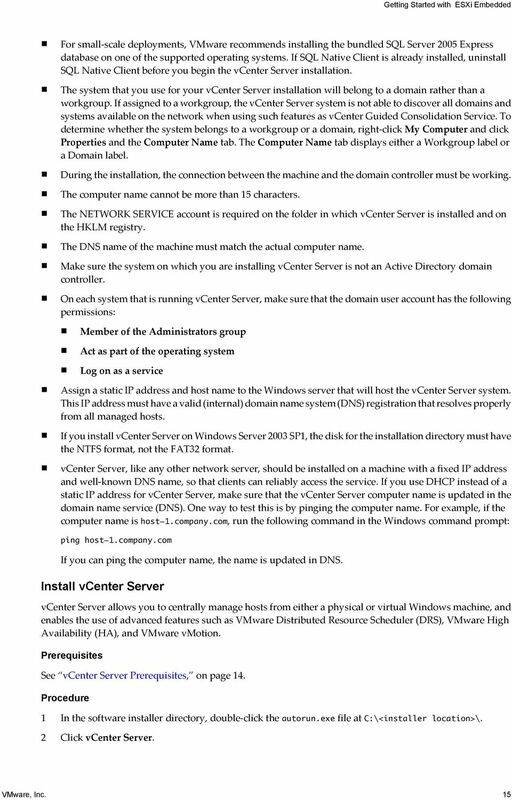 7 Type your user name, organization, and vcenter Server license key, and click Next. If you omit the license key, vcenter Server will be in evaluation mode, which allows you to use the full feature set. After installation, you can convert vcenter Server to licensed mode by entering the license key using the vsphere Client. 8 Click Install SQL Server 2005 Express instance (for small-scale deployments). This database is suitable for small deployments of up to 5 hosts and 50 virtual machines. 9 Select Use SYSTEM Account and click Next. 10 Accept the default destination folders and click Next. 11 Select Create a standalone VMware vcenter Server instance and click Next. 12 For each component that you install, accept the default port numbers and click Next. If another service is already using the defaults, specify alternative port and proxy information. 13 Select the amount of memory to allocate to the vcenter JVM in Tomcat, according to the number of hosts in your environment. You can adjust this setting after installation if the number of hosts in your environment changes. 14 Click Install. Installation might take several minutes. Multiple progress bars appear during the installation of the selected components. 15 Click Finish. What to do next After you complete the installation, use the vsphere Client to connect to vcenter Server. 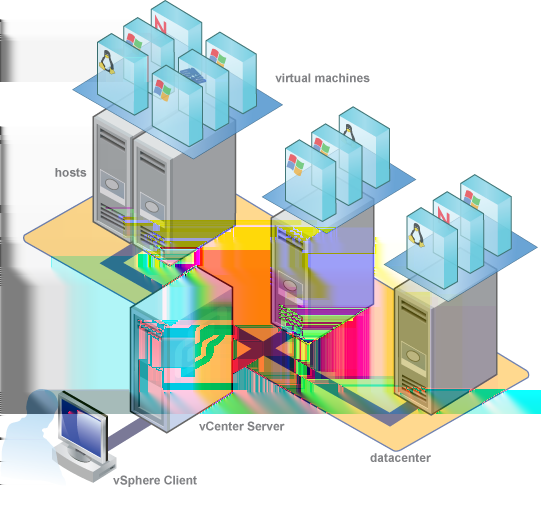 Start the vsphere Client and Log In to vcenter Server When you connect to vcenter Server with the vsphere Client, you can manage vcenter Server as well as all of the hosts and virtual machines that it manages. 1 Select Start > Programs > VMware > VMware vsphere Client. 2 Log in to vcenter Server as the administrator. a b c Enter the IP address or vcenter Server name. Enter your Windows administrator user name. Enter your Windows administrator password. 3 Click Login. You are connected to vcenter Server. 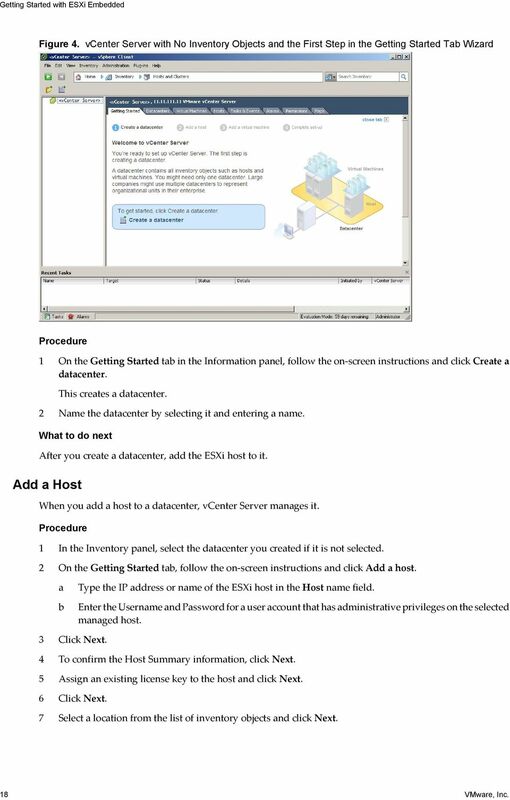 16 VMware, Inc.
18 Figure 4. vcenter Server with No Inventory Objects and the First Step in the Getting Started Tab Wizard 1 On the Getting Started tab in the Information panel, follow the on-screen instructions and click Create a datacenter. This creates a datacenter. 2 Name the datacenter by selecting it and entering a name. What to do next After you create a datacenter, add the ESXi host to it. Add a Host When you add a host to a datacenter, vcenter Server manages it. 1 In the Inventory panel, select the datacenter you created if it is not selected. 2 On the Getting Started tab, follow the on-screen instructions and click Add a host. a b Type the IP address or name of the ESXi host in the Host name field. Enter the Username and Password for a user account that has administrative privileges on the selected managed host. 3 Click Next. 4 To confirm the Host Summary information, click Next. 5 Assign an existing license key to the host and click Next. 6 Click Next. 7 Select a location from the list of inventory objects and click Next. 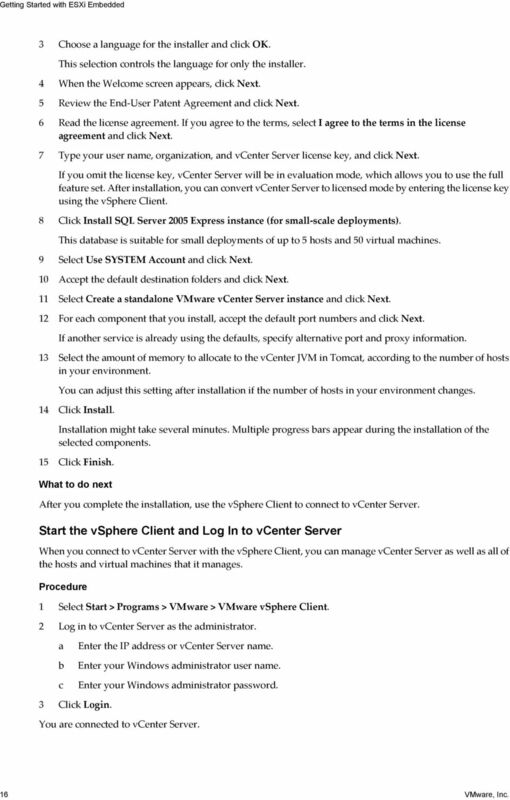 18 VMware, Inc.
20 Where to Go Next You have set up your vsphere environment. From here, you can do the following: Expand your virtual infrastructure capacity by adding more hosts and storage. Expand your virtual datacenter by creating and importing new virtual machines. Perform a consolidation of your physical servers using the Consolidation wizard. For more information about how to evaluate the features and benefits of vsphere, go to The vsphere Tutorial The vsphere tutorial contains information about many of the basic vsphere components and tasks. 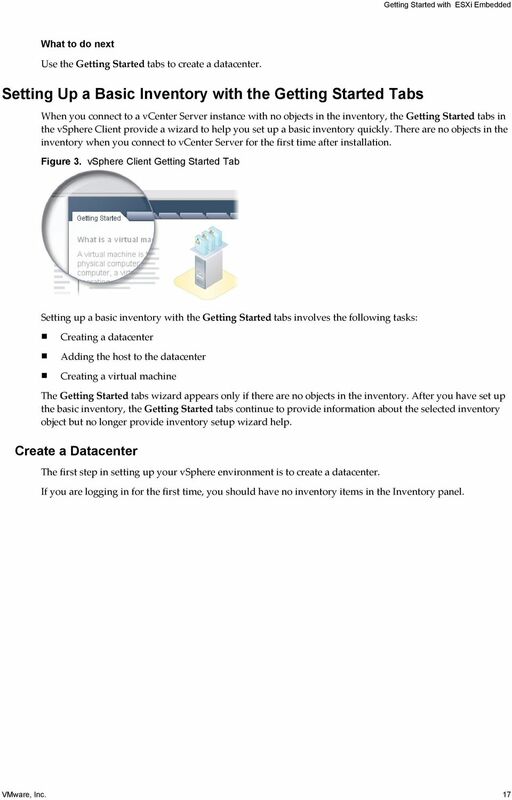 You can access the tutorial through the Explore Further links on the Getting Started tabs in the vsphere Client when you want learn more about the object selected in the inventory. You can also access the tutorial from the Help menu in the vsphere Client. vsphere Documentation Refer to the VMware vsphere 4.1 documentation for information on advanced host and vcenter Server configuration, setup for larger deployments for production environments, as well as information on advanced vsphere features. 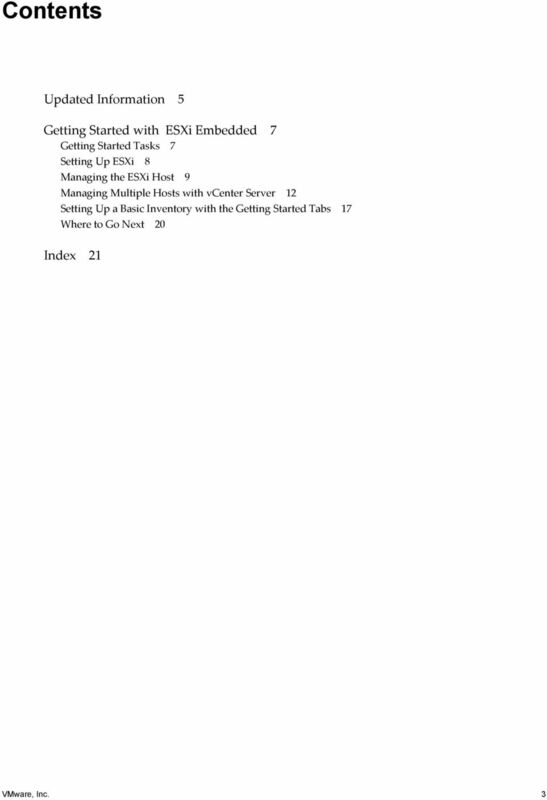 The vsphere documentation consists of the combined vcenter Server and ESXi Embedded documentation set. To access the current versions of this manual and other books, go to the vsphere 4.1 Documentation page on the VMware Web site. 20 VMware, Inc.